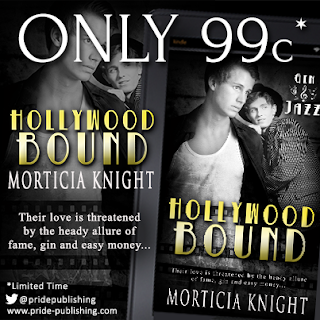 Hollywood Bound, the first story in the best selling M/M historical series from Author Morticia Knight, is on sale right now for just 99 cents!! It’s the silent film era of Hollywood and young, innocent Jack fights for love amid the heady allure of fame, gin and easy money. Can the newfound bond between Jack and Nick survive the tawdry mess that makes up the glitz and glamour of the celluloid kingdom, or will their own secrets tear them apart forever? Follow Jack’s journey to true love that begins with Hollywood Bound. Jack had an odd expression on his face, but he was usually moping around about something or another. He was just too sensitive. That was why it was good that Nick was there to take care of him. Nick combed his hair in the small mirror that hung above the oak dresser across from the bed. He double-checked to make sure that his face was shaved clean, and he rolled up his sleeves to not only combat the heat, but to hide the frayed cuffs. Satisfied, he set the comb down on the dresser and glanced over at Jack sitting behind him on the edge of the bed. Jack’s lower lip started trembling and somehow that made Nick even more furious. He poked Jack a little, trying to get him to smile. Nick was finally able to get a feeble one out of him but that was it. Nick sighed. He didn’t have time for this nonsense. All he was trying to do was protect him. He wished Jack could see that. “All right, come on. We’ll go grab some doughnuts and coffee at that little place on Sunset we saw when we got here, then we’ll visit the handyman shop and pick up some overalls. We’ll be just like those lunks we saw at the café—only better. Right, Jacky boy?” Nick elbowed him playfully like always, and Jack seemed to brighten a little. He yanked Jack up by his shirt sleeve, and pulled him close, wrapping his arms around him in a tight hug. It felt as if Jack were clinging to him like a life raft. Nick ruffled his hair a little and kissed the top of his head. He let him go. Jack is on the verge of silent film stardom, but Hollywood glory won’t heal his broken heart. A seductive screen idol and a conniving starlet create even more havoc in Jack’s troubled life and he places his trust in all the wrong people. Will a love that borders on obsession finally bring Jack true happiness? The pressures of being on the silver screen and being the lover of a demanding movie idol are difficult for the sensitive Jack to handle, and Roman’s increasingly erratic behavior only adds to his stress. Unwanted attention from other men and a startling revelation from movie star Trixie Fox adds to Jack’s confusion. All he’s ever wanted is true love, so how can he give up on Roman and the star’s promises of forever? Right as Jack feels that his future is looking brighter, a terrible tragedy occurs. But out of his despair, a new hope is born. Jack is given a second chance—one he never would have thought possible. As Jack’s blissful new life unfolds with his lover by his side, an unexpected visitor from the past threatens his new-found peace. It’s time for Jack to make his final choice. Will Carmichael, an impossibly handsome silent film star, longs for the broodingly intense director André Chenard. But as they take the tentative steps toward true love, an outside threat drives a wedge between them. As a result, they may have more to worry about than lost love—the threat could be to their very lives. Can they find their way to each other despite the hidden perils of the prohibition era? Former screen idol, Roman Pasquale, struggles to survive in Hollywood as the silent film era comes to a close. But a fresh new playwright is in town and he wants Roman to be more than just his star. Is their lust really love? Or will the drive for success destroy any hope they have for a happily-ever-after? Thanks for the excerpt. I've read & enjoyed the first 3 in this series & am looking forward to continuing it.